One of the most common conditions to impact the elderly is hearing loss. 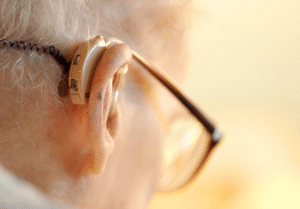 Approximately one in three adults between the ages of 65 and 75 experience hearing loss and nearly half of those over the age of 75 have difficulty with hearing clearly. Hearing loss in the elderly can impact quality of life when they feel cut off from the rest of the world. How would you feel if you could no longer communicate properly with your loved ones? Many seniors don’t want to admit to having a problem and become depressed and withdrawn. They avoid social situations because they are frustrated that they are unable to follow a conversation or participate in a conversation. This social isolation can have a negative effect on their daily life. Hearing loss can lead to loneliness and lack of socialization that can lead to cognitive decline. Often older people with hearing loss are mistakenly thought to be confused or unresponsive due to cognitive impairment. Their hearing loss might be mistaken as being uncooperative. And that negative perception from others can lead to depression and a negative perception of him or herself. The emotional toll of hearing loss can be significant. Family relationships can be strained by a senior loved one who is frustrated and anger because of their diminished hearing. They may be irritable and lash out on those who are closest to them. Married couples may fight over a spouses’ refusal to attend social events. Hearing loss can be a source of tension and stress that can lead to arguments and hurt feelings. And one of the biggest concerns with those who have hearing loss is safety. Would they be able to hear a smoke alarm in the middle of the night? Could they hear someone shout a warning to them or a siren? Could they follow the doctor’s advice for their medication or treatment? Could they hear the doorbell or if someone were breaking into their home? Hearing loss can become a safety issue for many seniors, especially for those living alone. Tell those around you. Share with your family and friends that you are experiencing hearing loss. It is important for others to know that hearing is difficult for you. Clear and loud. Ask others to speak to you clearly and with a loud voice, no need to talk very slow and shout. Sometimes it is helpful for loved ones to lower the pitch of their voice. Face to face. Ask loved ones and friends to speak to you directly so you can see their face. If you see their facial expressions and hand gestures, then you may understand them better. Turn off distractions. Turn off the radio or television if you are not listening to these. This background noise can distract and add to the hearing loss issue. Noise in public. Be aware of the noise around you and the effect it might have on your ability to hear. If you are near a busy road with street traffic, sitting in a restaurant near the kitchen, in a noisy party or event, or in a location with live music, these can all limit your ability to hear and follow a conversation. Invest in technology. A hearing aid might be the first place to start, but there are other devices to assist seniors with hearing loss, such as amplified telephones, flashing doorbells, vibrating alarm clocks, headphones and personal hearing devices for the television or radio, and strobe light smoke alarms. Hearing issues that go untreated may worsen. We recommend that if you are experiencing hearing loss to speak with your primary care physician or see a specialist such as an otolaryngologist, audiologist or hearing aid specialist. Hearing aids, medication, or even surgery can greatly help some with hearing problems.